A little bit about Kathryn & Matthew… I am a licensed psychotherapist/art therapist/astrologer/artist. I have my private practice in Santa Monica, and we live in Venice, CA, right by where Matthew’s store, Late Sunday Afternoon, is located. How we met… We met on the night of Matthew’s store opening on 10/10/15. Our mutual friend had been house sitting for him a month prior, when I joined her at his house for a sunset swim. When I went into his house, it felt eerily similar to my house, with the same books, art, crystals, etc. So on the night of his store opening, I told him that we had similar interests and aesthetics and I literally heard from him every single day after that. Our Engagement Story… I told him that I didn’t want him to make a big deal out of it! No “down on one knee,” just to please keep it casual. So he took me hiking on my birthday in May, and he gave me my “birthday gift” when we got to the top, and it was the MOST beautiful ring I had ever seen in my life! 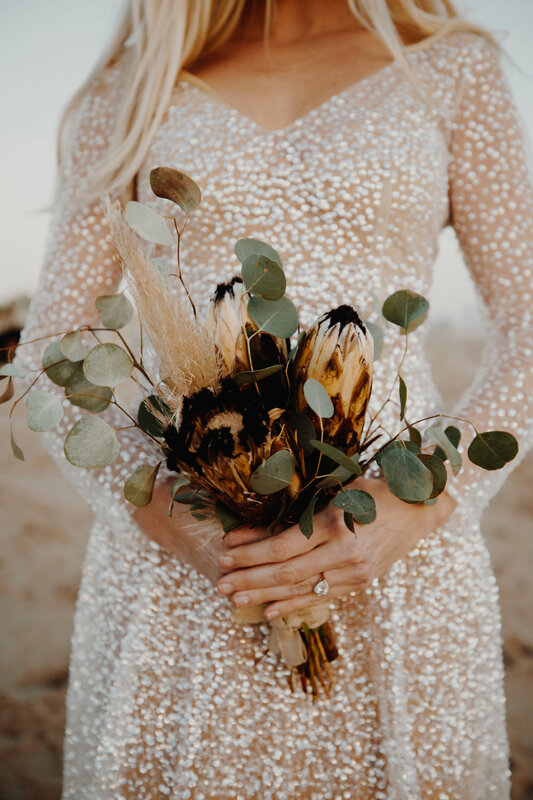 The Dress… I was looking for something fun, bohemian, and sparkly since we were getting married on NYE. I tried on several embellished dresses and while they were beautiful, they were way too heavy and uncomfortable. I know myself very well and comfort is the most important thing to me. As soon as I tried on the Sydney gown, I knew it was the One. 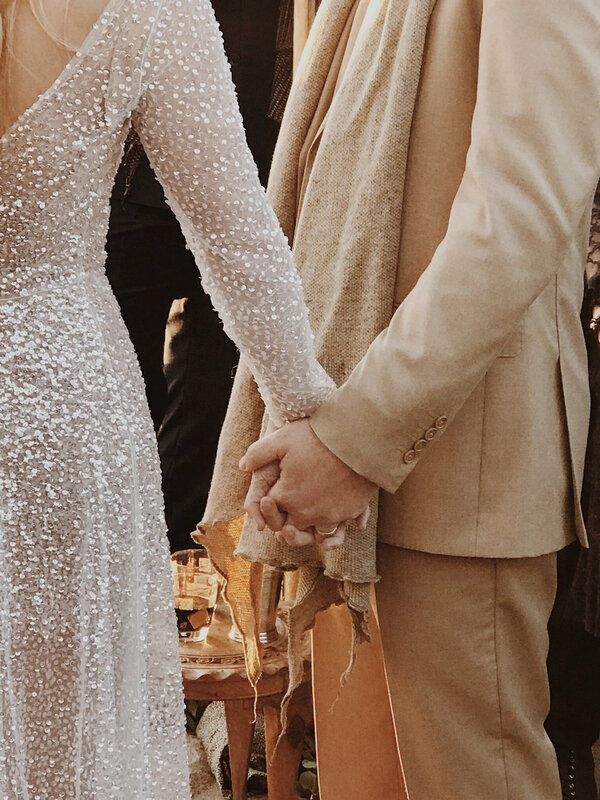 I asked if we could add sleeves since it would be a winter wedding, and I love long sleeves on evening dresses - I just think it’s so elegant. 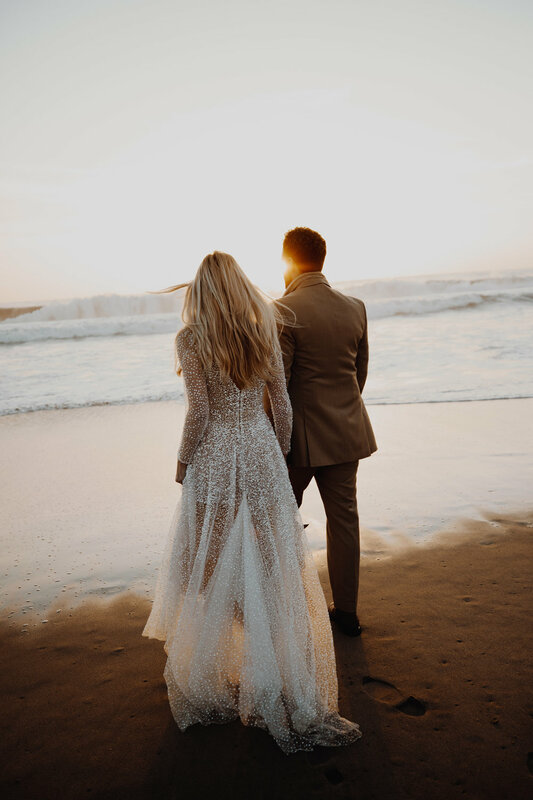 When you know, you know… I purchased my dress from En Blanc in Santa Monica, CA. I have never gotten so many compliments in my life-literally everyone was asking me where I found the dress. The dress was MAGICAL! Also, it was so easy to get my gown custom (adding the sleeves). Bridget from En Blanc made one phone call and it was done. 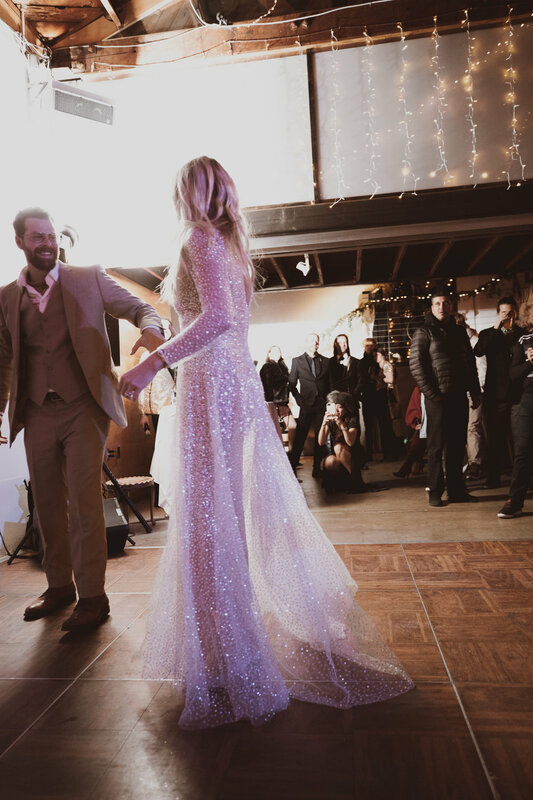 How I felt wearing my dress… MAGICAL! I loved the sleeves and the delicate sequins. It was elegant and sparkly, like a dress that a fairy would wear! It was PERFECTION in every way. 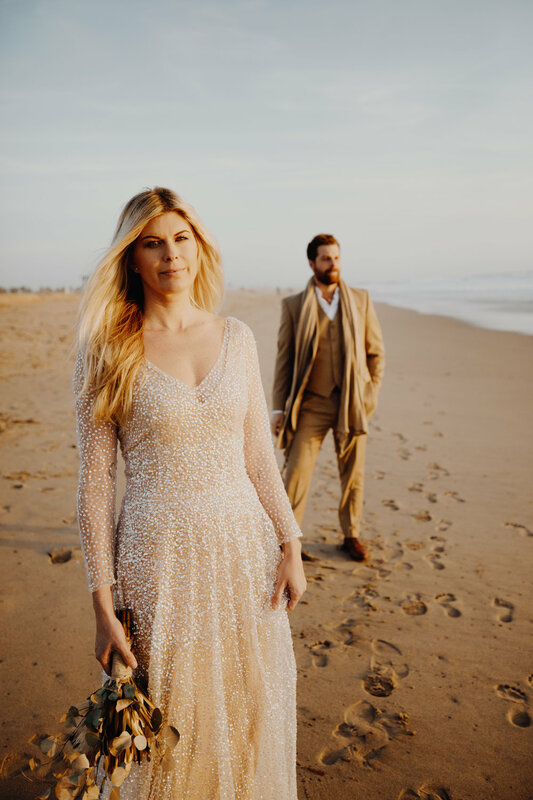 Our Wedding Day… I wanted the day to be simple, casual, but elegant. We wanted the wedding to be non-traditional and mystical. My favorite part was the ritual we had on the beach before the reception. We all walked out in a large procession to a chuppa made by @morningaltars. The sun was setting behind us while all of our closest friends and family were watching, and it felt so magical! The gown was sparkling in the sunlight and it looked like a dream. Pearls of wisdom for future Brides… Your wedding is an opportunity to create your ultimate art piece and get creative. Don’t be afraid to do something non-traditional out of fear of what others will think. 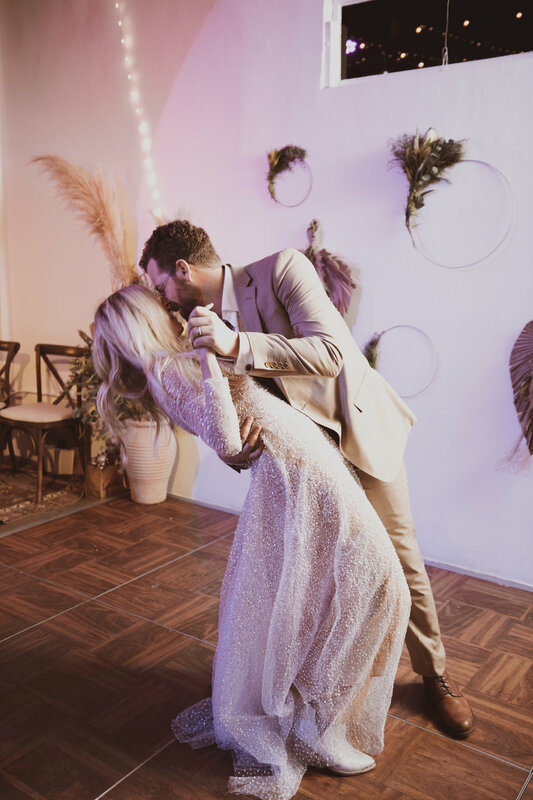 The most important thing is that your wedding reflects YOU and the love you share with your partner - whatever that looks like!